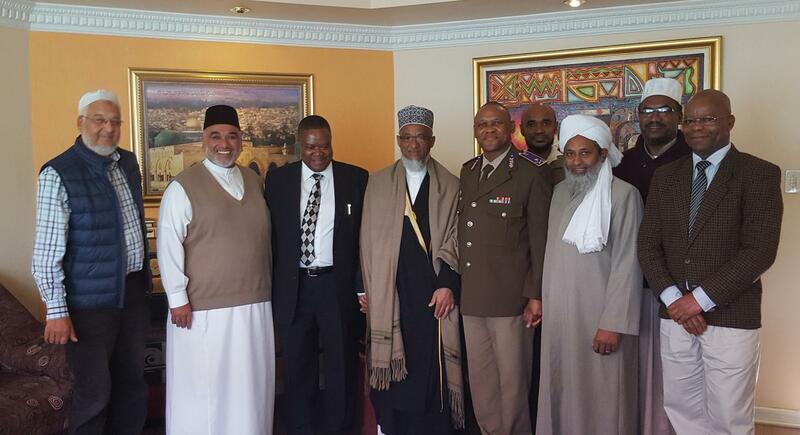 Dr.Sam Gulube (DSG), Secretary of Defence and his delegation comprising of Brigadier General M.A.Jamangile (MAJ), Chaplain General of SANDF and Dr.Colonel T.Masuku (DTM), Chief of Staff of Chaplain General Head Quarters, were hosted by the Leadership of the Muslim Judicial Council(SA) at a historic meeting held on Friday, 26 May 2017. Shaykh Shahid Esau (SSE), Senior Member of the MJC and Member of Parliament, officially welcomed the delegation and introduced all MJC employees present at the meeting individually. Shaykh Irafaan Abrahams (SIH), Executive President of the MJC started proceedings by thanking the delegation for their presence which is valued and honoured by the MJC Leadership.It is highly appreciated that you have made time available to listen to our concerns even though you have a busy schedule. SIH made a brief comparison of the experiences of the dark days of apartheid and the current democratic system whereby the latter makes it possible for every citizen to aspire as a leader of our country. As proud and peace-loving South African citizens, we believe in adhering to protocol and procedure to lodge our concerns and resolve it amicably with respect and dignity. SIH re-iterated that the MJC is ready to partner the SANDF in joint- ventures to serve our community. DSG responded by saying that his delegation should rather be honoured for meeting with the Leadership of the MJC after such a long time. His visit was long overdue and he will make a concerted effort to visit the MJC more frequently.The SANDF is not all about military operations, but is also engaged in a vast number of community outreach programmes relating to crime, child/woman abuse, security, orphanages and self-empowerment and this meeting today has created the platform to foster relations and joint partnerships to alleviate the various challenges facing our community. The Secretary of Defence oversees the Director Generals of Dept. of Justice and Correctional Services, SANDF and SAPOS better known as the JCPS Clusters. Although the defence budget was reduced by R1 billion and would definitely have an impact on services and projects, it should not make us despair as funding will be sourced to finance outreach community programmes. The Secretary of Defence and President of MJC will head-up a Joint Planning Task Team which must provide a workable plan with specific time frames for the execution of community projects. He has undertaken to submit the JCPS projected plans to the Minister and Chief of Defence respectively for perusal and has been mandated to approve the execution of community outreach programmes. He reiterated his vision of uplifting and empowering Small and Medium Enterprises as the preferred procurement supplier to the SANDF and not Foreign and Corporate conglomerates. This initiative will enhance upliftment, empowerment and job creation amongst our community. MAJ emphasized that caring about people and their faith in a diverse society is of utmost importance to the SANDF. He gave a concise summary of the policy, procedures and protocol that needs to be followed to bring about policy amendments. The MOU signed in terms of religious groups have not changed and the relaxation of policy and procedures must be addressed via the correct channels with the policy –makers to obtain approval for the implementation of amendments. He requested the Muslim Chaplains to advise servicemen/women to adhere to the dress code as the status quo remains whilst discussions are underway. DSG informed the meeting that SAPS and Correctional services will be engaged in terms of the completion of MOUs’ for the relevant departments. It is very important to note some concerns can be relaxed in short period of time, while others might take a much longer time frame for approval.If SANDFis engaged well in advance military displays, tattoos and erection of stalls at open day events at Muslim and non-Muslim schools can be arranged. This will allow the SANDF to display their activities, provide information and share job opportunities with the youth.The MJC should use their authority to encourage Muslims including youth to serve as reservists in the SANDF. Reservists are called upon to support servicemen/women in case of emergency and will be paid for the service rendered. SSE suggested that serviceman/woman working in remote areas should engage the Imaam of the nearest mosque to assist with transporting servicemen/women to the nearestMosque for Friday prayers. A file with military dress codes, photos and policy documents of foreign countries employing Muslim Servicemen/women were handed to DSG for information and consideration. MAJ ended off proceedings at 12:15pm with a closing prayer.